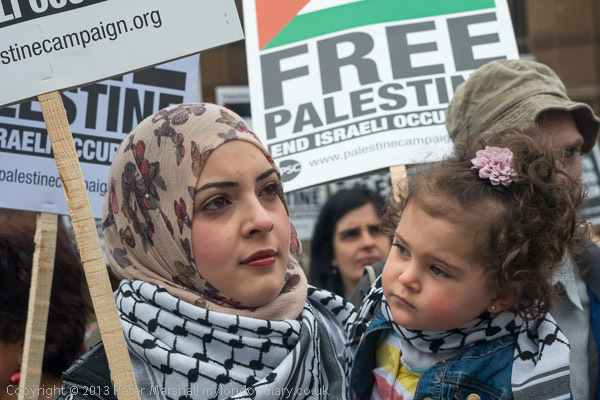 Some days – like tomorrow – there are more protests in London than I could possibly attend, starting in different places at the same time, and I have to make a choice of which to attend. Although tomorrow I’ll miss at least the start of most of them, with the memorial service of an old friend taking place in the middle of the day. But two weeks ago, there were a number of events nicely spaced out across the day, so I could easily cover a number of them. First was a protest outside Parliament against the Israeli actions against Palestinians, now relegated to around an eighth of the land they occupied before the formation of Israel, End Israeli Ethnic Cleansing marking Nabka Day (actually a couple of days earlier) which had been brought forward a couple of hours to enable those attending it to go on to a march supporting the NHS and opposing the plans of the government for its privatisation, which is going ahead full steam through the back door – more in London Marches to Defend NHS. The Nabka day event didn’t quite get going soon enough, and was really just getting into its stride around 12.30pm when I decided I needed to be on the other bank of the Thames at Waterloo where the NHS march was massing. The quickest way was on foot, and normally it would have taken me a little under ten minutes, running a little or at least walking fast, but I was slowed down by being with a couple of other photographers who obviously weren’t as fit as me and it took a little longer. 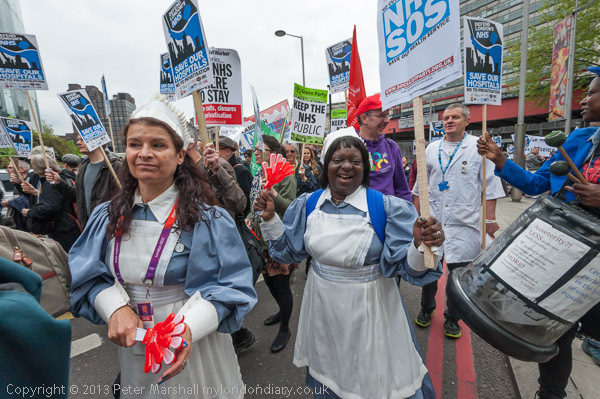 The NHS march was a fairly large one, with several thousand marchers from across London, including many I’d photographed at the various protests against hospital closures in Ealing, Lewisham and North London. Like most such things many of the best opportunities for pictures are in the half hour or so before the march starts, and I was a little later getting there than I would have liked. It started more or less on time at 1pm, and I went with it across Waterloo Bridge and up the Strand. Normally I would have stayed with the NHS marchers and photographed the rally they were going to have in Whitehall, but I wanted to photograph another protest, starting at the US embassy in Grosvenor Square at 2pm, a Guantánamo Murder Scene marking the 100th day (actually the 101st) of the hunger strike by over a hundred prisoners there. As the march stopped just before Trafalgar Square I scurried down into Charing Cross Underground station and took the tube to Bond St (a short journey with just one change) rushing out and across Grosvenor Square to arrive just a couple of minutes late – for once the protest had started very much on time. Had I been there earlier, I might have suggested the organisers move it just a few feet away from the hedge towards the embassy, which would have made it easier to photograph. Because if you are going to have a protest at an embassy, it is often a good idea to have the embassy visible in the pictures, and when I got there all the photographers and videographers were in a long line with their backs to it. I took the picture above a little later, when they had dispersed a little around the scene, but I think I will have got in rather a lot of other people’s pictures earlier, trying to get similar images. As you can probably see, I’ve made use of the wide angle of the 10.5mm Nikon fisheye, correcting the verticals in post-processing using the Fisheye-Hemi plugin as I often do. 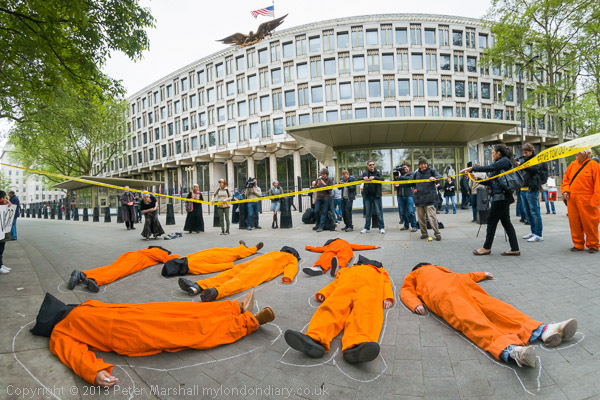 The wide angle means I’m very close to the ‘bodies’ on the pavement, emphasising them in the image while getting all seven in (earlier there were eight – one for each of those who have died probably as a result of earlier hunger strikes there.) Keeping the lens upright keeps the verticals on the building upright, and the wide angle just takes in the roof of the embassy with its American Eagle and US flag. Fortunately the bodies on the ground weren’t moving so I was able to wait until the wind was blowing the flag out well. One thing I’m not entirely happy about is the colour, and particularly the orange suits, some at least of which I think incorporate fluorescent dyes. They tend to block out all highlight details when exposed normally, despite the highlights being kept within the histogram. I was using the 10.5mm on the D800E to get reasonably sized files (16Mp) from the DX format, and I don’t have ‘untwisted’ profiles – which usually help – for that camera to use in Lightroom. I had to do quite a lot of burning and slightly de-saturating some of the suits for this image – and in the hurry to file the pictures it wasn’t perhaps quite as careful as it might have been. While I was at the embassy a couple of other groups of protesters also turned up. One was a protest by a few Syrians and the CPUK-ML (Communist Party of Great Britain – Marxist-Leninist, a small anti-revisionst splinter from the Socialist Labour Party) in support of President Assad, and the other a group of Muslims who had come to support the protest by Narmeen Saleh Al Rubaye and her daughter I wrote about in Lonely Vigil at US Embassy a few weeks ago. I didn’t have time to do both justice and took rather more pictures of the Muslims, as you can see in More US Embassy Protests. 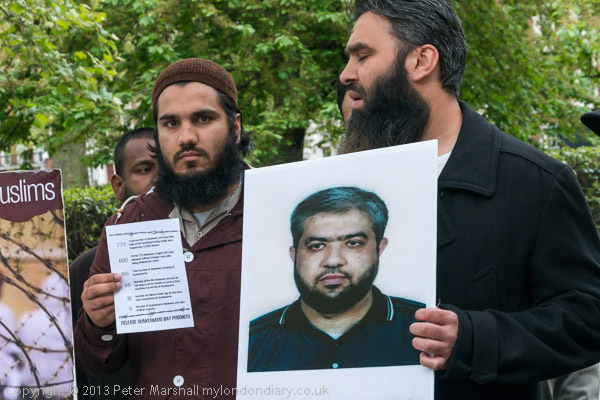 I also knew that there was another march taking place through London, and I left the US embassy shortly before the event there finished, hurrying down on foot again through Mayfair towards the Ritz hotel which was on the route. 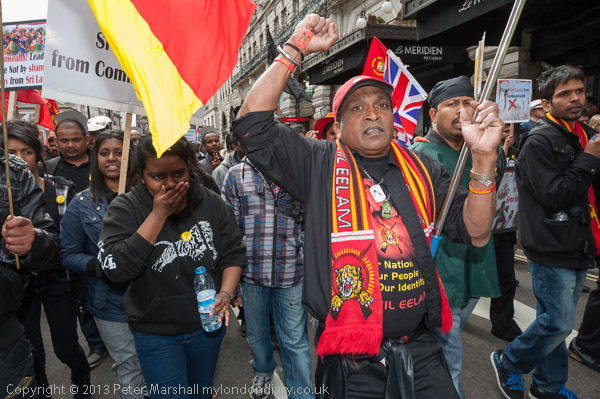 Quite by luck I’d timed it about right, and was able to catch up with the head of the march – Tamils protest Sri Lankan Genocide – about halfway between there and Piccadilly Circus. By now I was rather out of breath and was happy to stop there and photograph the rest as it passed by me on the way to a rally at Waterloo Place. As the end of the march passed me – and the officer in charge of policing breathed a sigh of relief, saying “it’s the end at last” as there had been several thousands – I hurried down by the side of it to the rally, which had not yet started, taking a few more pictures before I decided I was tired and had done enough and it was time to go home and file the four stories. Too late of course for them to be ‘news’. This entry was posted on Friday, May 31st, 2013 at 05:09 pm and is filed under My Own Work, Photo Issues, Political Issues. You can follow any responses to this entry through the RSS 2.0 feed. You can leave a response, or trackback from your own site.